Salutations! Many of my friends on Cottage Fix are no strangers to the excitement of a gut job renovation or maybe a cosmetic remodel. 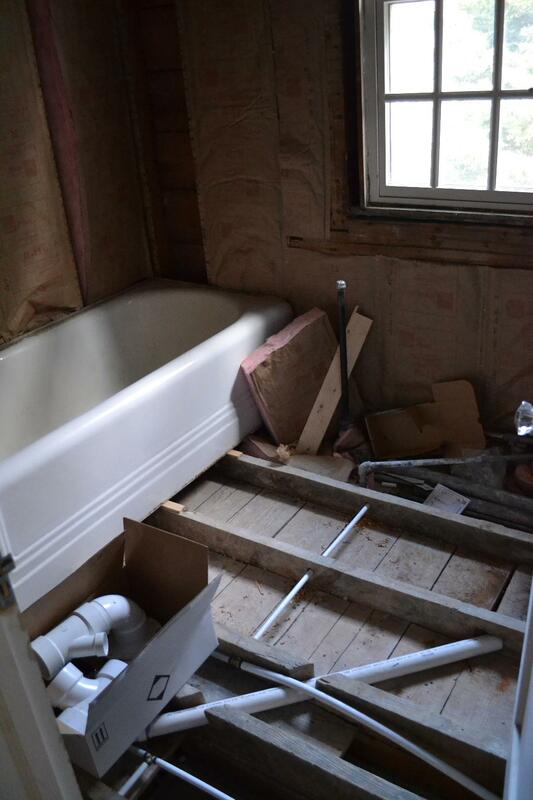 But for those of you who have yet to get your feet wet and are thinking about diving in head first, I thought you might like a little peek behind the scenes of our bath remodel. And for those of you that have been in the thick of it, please feel free to laugh along with me. Laughter is the best medicine some days for sure. It always amazes me how much work goes into it before anything really starts to take shape. Mr. Macho has been working so hard and we’ve had a few different contractors out (they’ve all been awesome!) and I’ve been doing a great job of not freaking out amidst all the chaos. That’s basically my job at the moment, no freaking out. Loads of painting awaits me, so I’m certainly enjoying my current position for now. Totally nailing it girls! Not freaking out one iota. Grin! Not much decorating going on at the moment though. The bath remodel seems to be slowly taking over, much like ivy does in Spring. It’s just slowly creeping into every free corner of our little cottage. The bathroom radiator is making herself comfortable in the guest room along with some tools and supplies. There’s a cabinet and light fixtures in the living room and the garage is filled with little marble hex tiles. They’re so cute! And then there’s the holes in the walls which I new were coming, but it always seems so sad when your putting a new hole in the wall. I just love these old plaster walls—I need a band aid ASAP. All will be fixed and forgotten in the end. At least that’s what they say, but I’m not so sure. The super cool 1930s tub is staying and getting reglazed and fitted with new hardware after the drywall and tiles are in place. We went back and forth on this one. But they just don’t make ’em like they used to, now do they! The vintage sink is being reglazed now and I can’t wait to see it in place. This is the nitty gritty of our bathroom remodel so far, I’m hoping it will be much more fun to photograph in a month or so. This entry was posted in cottage makeovers and tagged bathroom, cottage, remodel on January 22, 2015 by sally. I’ve got a very similar 1920 tub and I’m anxious to hear your views on the reglazing process. 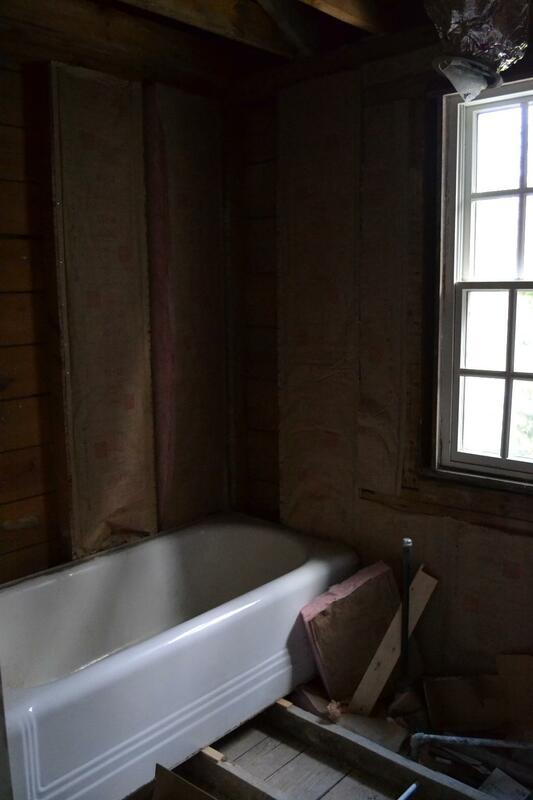 It’s hard to see the beauty amongst the insulation and bare floor boards, but I know your bathroom is going to be gorgeous when it’s done, Sally! I wish the previous owners had installed period floor tiles in our bathroom. We had them in our previous home and I loved them! Enjoy the dusty progress! Sally, you are sooooo correct when you say once the project is complete, you tend to forget about the dust, inconvenience and the overall mess of a remodel. Hubby and I remodeled our half bath off the kitchen. 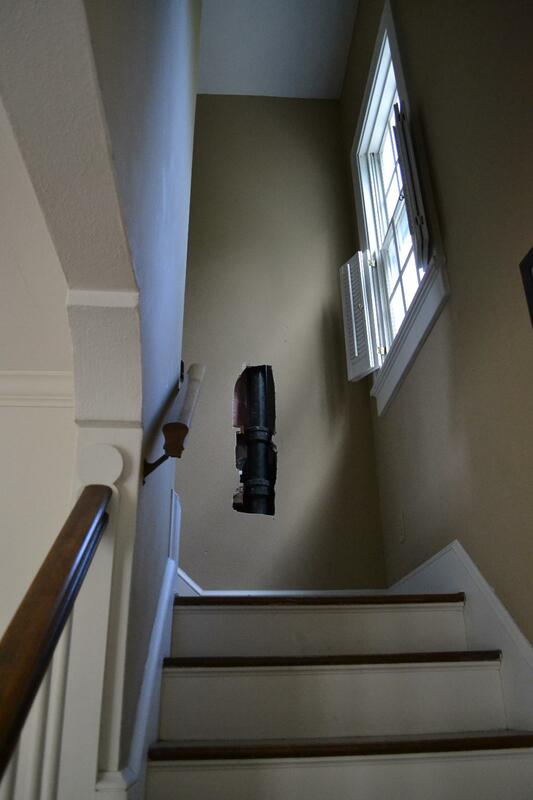 Even though it was huge pain in the tush and took six months (cracked toilet, rotten floor boards and not ordering enough hex floor tiles) I forget about all the yuck and appreciate a sweet period style half bath. Keep laughing, soon it will over. Wow…this really is a major gut job and renovation! I always Hate the process, but love the results. It’ll be so worth the mess when it’s done. Oh, it’s going to be so nice! I love that your home is old and has so much character. That will automatically give your bathroom the charm you want. Can’t wait to see the final reveal! Putting holes in plaster walls is tough. I feel for you! The remodel looks great so far. Can’t wait to see more pictures. I bet you’re so excited to watch the project, although I’m sure it is going slower than what you’d like. I can hardly wait to see it when it is finished. I love watching construction in just about any form. I have new kitchen cabinet doors that I just hung yesterday. My brother-in-law and I made them, although he is the master-mind behind them and it was all his tools. He just put me to work and I helped as I could. I haven’t had cabinet doors for 2 years now. It didn’t bother me for the longest time as I or my brother-in-law were just too busy to get to it. Then it hit me one day, that I couldn’t take it any longer and I told him I was at his disposal. I would make room in my schedule, so on New Year’s Day, we worked in his work shop all day. I put the first coat of paint on them this morning and I could kick myself for waiting so long to make time for this project. I just LOVE them. Renovating is so exhilerating to me, especially when it all comes together. One day I’ll blog about them, but there is still a lot of painting to do yet. Enjoying the lazy afternoon and watching the snow come down. Ummm, I’d be freaking out – BIG time! Wonderful of you to be keeping a cool head!